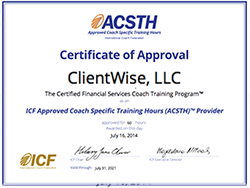 The Certified Financial Services Coach Training Program™, offered by ClientWise, LLC has recently renewed their designation by the International Coach Federation (ICF) as an Approved Coach Specific Training Hours (ACSTH) Program. This 60-hour course is the only approved course designed specifically to assist financial professionals in obtaining the vital skills needed to become an accredited coach. It's important to note that the ICF is the largest governing body over the coaching industry and holds all ICF credentialed coaches to a higher standard of ethics and performance. Over 100+ financial professionals have completed The ClientWise Certified Financial Services Coach Training Program™ since 2012, and we want to continue embedding the power of true coaching into the financial industry. There's only a few seats open in our Financial Services Coach Training Program™ that kicks off in September at our New York office! In the program, you’ll learn the skills to actively listen to your clients’ needs, ask powerful questions, increase your communication and relationship building skills, as well as begin the process of becoming an International Coach Federation Associate Certified Coach (ACC).